I have a FormsCentral document that you guys were kind enough to upload for me. I've noticed that a few of the fields don't work the same way and I need to get these updated. Can you help? So - take a look at the adobe form. In the middle section at the words 'eTrain: Yes/No'. If you select Yes, then another set of data populates (module information). This is VERY GOOD. So now take a look at both Adobe and Jotform Versions: the top section where it says 'Originator', then 'Department', 'Planned Activity', Project Code 1, Task Code 1, Dept Code 1, Project Code 2, Task code 2, Dept Code 2 and Project Lead. All of these fields have 'other' as a choice. But, then you choose other, you don't get the additional 'blank' popup that allows you to input free form data. Can you update the form to work like the adobe form works? Thank you for providing us with both URLs Brooke. Please give us a few moments and we will update you once we add what you have mentioned. I took a look at it, but can not find the Project Lead having Other option. I do see "Choice 1", but as it does not present a textbox it would be good if you can tell us which field is it exactly? Once we know the Project Lead, we can help you add that one to the list as well. 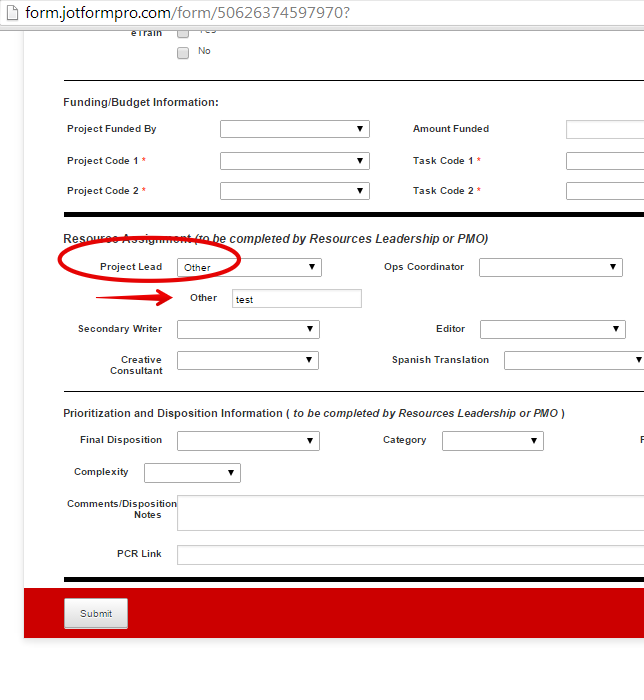 The 'Project Lead' should also have 'other' listed as an option...it's currently written as 'Choice 1'. Can you add that to the options as well as the new field to populate? Please do implement these changes to the document so that we can work from the updated document. And thank you so much for your help! 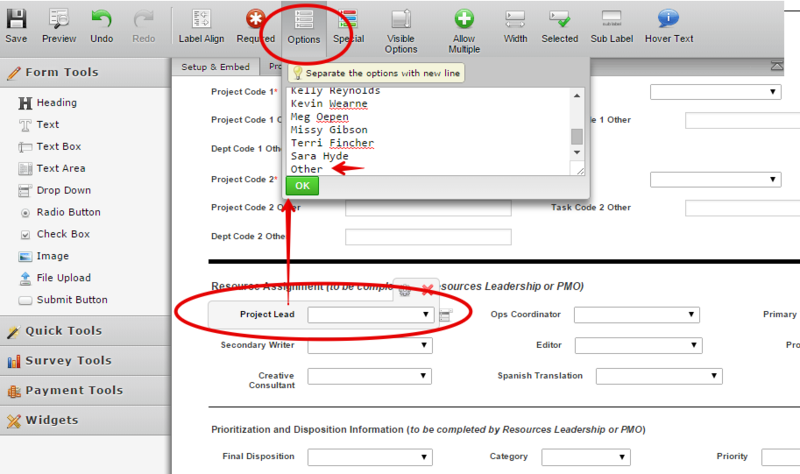 and then create option that when 'Other' is selected in Project Lead, a new input/textbox will be available?